Are you having a rough day? Unable to cope up with your family and work life? Are you having sleepless nights? Do not worry. You are not alone. In this fast paced world, every individual is facing these kind of problems in their day-to-day life. People look out for ways to put their inner self at peace and lead a calm life. With the rapid increase in the smartphones people search for apps that would put an end to this stressful life. The Play Store and App Store have a number of apps to help you meditate, relieve your anxiety and sleep better. You will definitely be overwhelmed with the number of choices you have, but I personally recommend this one particular app with 5K+ downloads. The SOS Method: Meditation is a new invention for the modern world, that works with people’s physical and mental well-being and assist them in leading a happy, healthy, mindful and productive life. The team has more than a decade experience in the field, testing real people of all ages, cultures and circumstances who have experienced changes in their state of mind and unhealthy habits. Falling under the Health and Fitness category, the app SOS Method: Meditation, is definitely a boon to everyone of us. It is one of its kind and provides a stress- free, healthy and a happy life. Specially designed meditation of 5 or 11 minutes that helps us soothe and revitalize our busy minds. 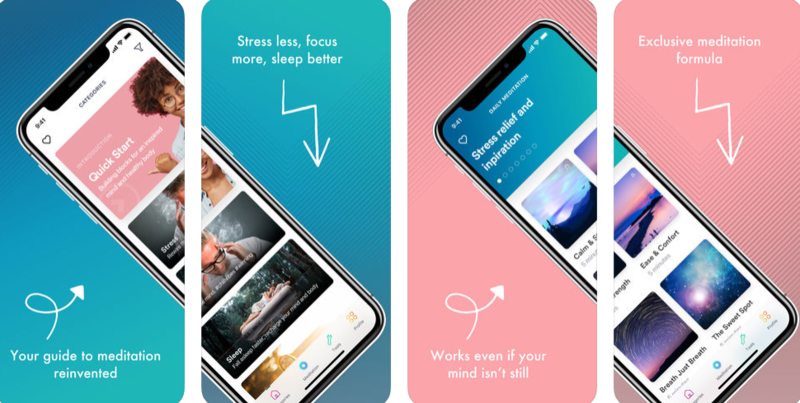 Stress Relief and Inspiration, Relax and Deep Sleep, Soothing and Therapeutic, Whisper Collection, Emergency SOS; Calming anxiety, Forgiveness and Love are the various meditation options in the app. Other life tools in SOS Method: Meditation help us to handle our rough day, make space for love and turn our dreams into reality. Stress Relief, Sleep and Focus are the three key strategies that the app addresses its users. The app is very aesthetic and easy for use. All you have to do is to sign up with your Email Id to make use of the app. The app is free for download on both the App Store and the Play Store but some videos in the app cannot be used unless they are unlocked with a monthly or annual subscription fees. Come on, what are you waiting for? De-stress and power up in just a few minutes with this awesome meditation app.